Ever wondered what it feels like to be surrounded with emerald green meadows that stretch infinitely? Ever wished to spend quality time near a crystal-clear flowing river, while breathing fresh air blown from sky-high pine trees? Then, Doodhpathri is definitely where you should be. An off-beat hillstation situated 42 km away from the capital city of Srinagar, Doodhpathri has recently entered the charts of Jammu & Kashmir Tourism, making it a secluded and serene hillstation. This bowl-shaped valley is located in Budgam district of Jammu & Kashmir, and is at 8957 ft altitude from the sea level. Doodhpathri means "Valley of Milk", and there are several stories to the origin of its name. Some say that the river flowing on the meadows gushes with such force that it looks like milk from a distance. Another interesting story is that a famous saint of Kashmir once prayed for water and pricked the ground with his stick, only to have milk oozing out of the ground. Make sure to walk on the icy pebbles of different sizes surrounding this river and soak your feet in its cool water. By Air: The closest airport to Doodhpathri is the Srinagar International Airport. From there, buses are available from Humhama area to Budgam, which is about 2 km from the airport. By Road: Take a bus from Lalchowk Srinagar to Badgam (30 km in distance), from where you can catch a vehicle to Khansahib. From Khansahib stand, you can hire a cab to Doodhpathri. It is about 2-3 hours journey in total. The weather is relatively pleasant throughout the year. However, in winter, you can see clear slabs of snow; while in summer, a green carpet of grass can be seen. Therefore, June-July would be the ideal time to visit if you want to see the green. Between December and January would be the right time if you want to experience the freezing cold snowfall. Carry a tent and find a nice spot, preferably closer to the small shops or Gujar's hut (Gujar- pastoral community) and have a quality time with your loved ones around a bonfire. Friendly residents will offer Kashmiri tea and bread the following morning, if you pop into one of the huts or shops. Followed by this, you can go trekking to small hills nearby. Doodhpathri will take an entire day to be visited. Since Doodhpathri is still a developing tourist spot, hotels around the place may not be available. Make sure to pack your lunch and also dinner, if you're camping in the place. The roads to Doodhpathri are not in a good condition, so the travel might be hectic. But the sight of this heaven on earth is completely worth all the trouble. Tangnar: It is a beautiful place of small valleys with deaodar and pine trees on small hills, located just about 2 km before reaching Doodhpathri. 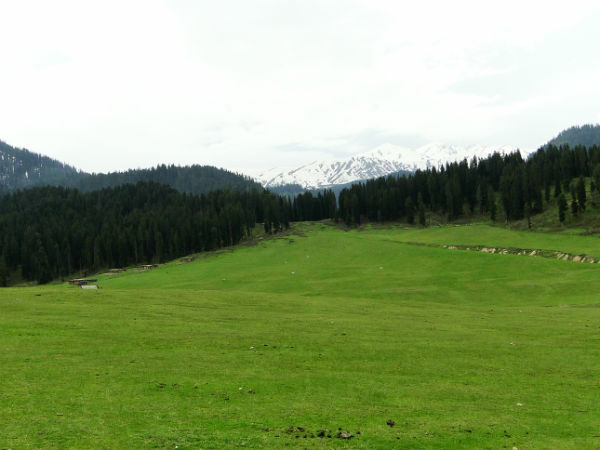 Yusmarg: About 4 km away from Doodhpathri lies another spread of green pasture, a tranquil beauty called Yusmarg. The bed of greenland that we get to see now used to have wildlife and was famous for having a large number of deers. Only a few decades ago, it was discovered as a potential spot of tourism. Palmaidan: It literally translates to "big stones". The place is named after huge stones that are spread across the luscious grass, 5 km away from Doodhpathri. It also happens to be a favourite spot of the local shepherds, where you'll find them perched on these stones, waiting on their cattle.